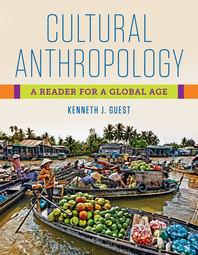 Best-selling author Ken Guest presents the essential readings and diverse voices that will help students understand their rapidly globalizing world. This concise, affordable reader is designed to complement any introductory syllabus and is the perfect companion to Guest’s market-leading texts. Guest’s engaging reader focuses on cutting edge topics students care about, like the environment, the body, income inequality, sexuality, race and racism, migration, and more. In addition, Guest’s rich headnotes and smart discussion questions help students understand important contexts and apply readings to the world around them. This reader is not only the perfect companion to Ken Guest’s market-leading introductory books, it can also be used as a standalone text or combined with additional textbooks or ethnographies. At only $20 when packaged with Cultural Anthropology: A Toolkit for a Global Age or Essentials, Guest makes anthropology’s diverse voices accessible to all.